Here’s an Indonesian curry that’s so easy to make and so delicious that you’ll be sad that you didn’t know about it earlier. It’s not hot/spicy, but is intensely flavored. The recipe comes from James Oseland’s “Cradle of Flavor” book, whose many recipes were learned from home cooks and street vendors when he lived in Indonesia. Most of the recipes are as firmly authentic as you can get. 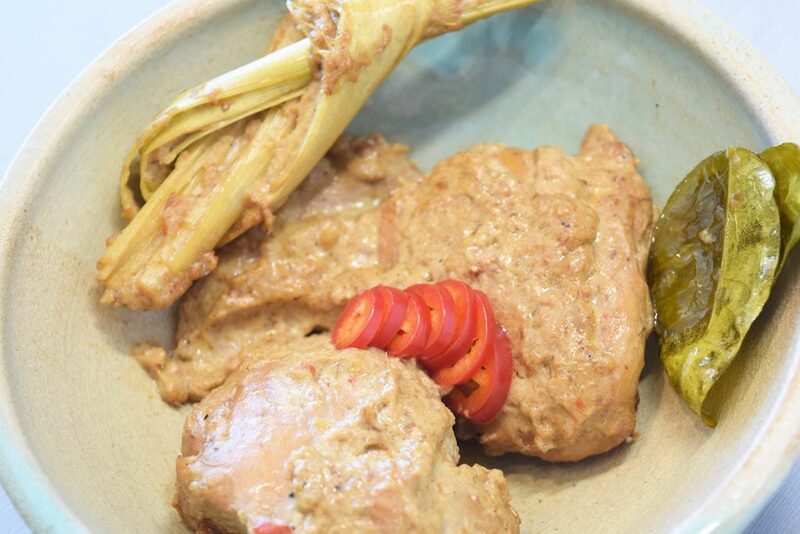 Indonesian food tastes so good that it almost defies belief, and Javanese chicken curry is no exception. I’ve had the recipe for years, but never decided to make it until now. Big mistake, as it will be on our monthly menu from now on. Many of the Indonesian meat and chicken dishes follow a pretty basic framework: 1) make a spice/seasoning paste from ginger, garlic, shallots, etc., 2) brown the meat in a heavy fry pan, 3) add the seasoning paste to the meat, 4) then add coconut milk and slowly simmer. You’ll see this on these postings for both beef and chicken rendang. This chicken curry is not much different from that framework. *This list may seem long, but many of these items can easily be used in other recipes, and they’re not hard to find. 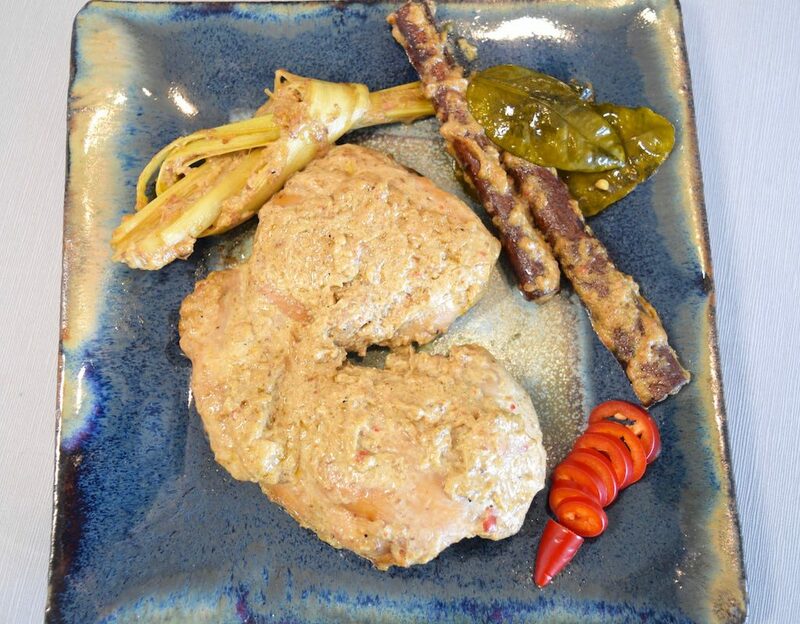 **It’s recommended to use whole chicken pieces, but they’re disgusting to me, so I use boneless chicken thighs. Using darker meat makes for a more flavorful dish. Get ready for some amazing smells coming from making the spice paste, and then from the curry. If you’re using whole coriander seeds, grind them to a powder in a spice grinder. In a small food processor, add the ground coriander, chili, shallots, garlic, ginger and galangal and pulse until you have a smooth paste. If this is not working well, add a tablespoon of water and scrape down the sides of the food processor. Rinse the chicken pieces, pat dry and set aside for now. Add the oil to a 3- 4-quart saucepan or soup pot and heat to medium-low heat. To check for the right temperature, drop a bit of the seasoning paste into the oil. If it sizzles without scorching, the heat is right. Add the paste and sauté until the garlic and onions don’t smell raw. Then, add the cinnamon, lemongrass knot and lime leaves and stir them into the seasoning paste. Continue sautéing until you can clearly smell the cinnamon. This whole process takes about 6-7 minutes.Add the chicken, raise the heat to medium and sauté the chicken until browned. Ensure that the chicken and seasoning paste do not scorch in the bottom of the pan. Add 1 cup of the coconut milk, the water and the salt and stir with chicken to combine. (While reviewing this recipe, noticed that I had accidentally omitted the water. This made for a very rendang-like curry, instead of a creamy sauce-like curry. It was still delicious, though.) Cook at a low simmer for 40-50 minutes, until the chicken is cooked through. Ensure that you don’t overcook the chicken—it will get tough. When the chicken is done, stir in the remaining cup of coconut milk and thoroughly heat through. After cooking, let the dish rest at room temperature for 20 minutes, which intensifies the flavor. You can remove the cinnamon and lime leaves before serving, if you wish. Serve with white rice or some type of crusty bread to mop up all the delicious sauce. « What Is The Glycemic Index?